Woodrow Wilson quarterback Nick Kargman (2) broke the state single-game passing record with 539 yards against Cedar Creek on Saturday. 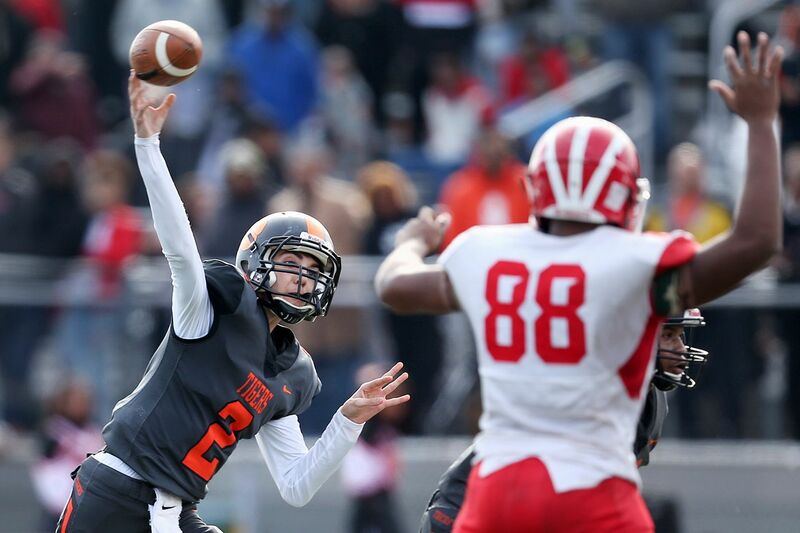 Woodrow Wilson quarterback Nick Kargman set a New Jersey record with 539 yards passing as the Tigers, the Inquirer's No. 4 ranked team, topped No. 19 Cedar Creek, 59-37, on Saturday. Kargman broke the mark of 536 yards set by Timber Creek's Danny Williams in 2013. It was the second record Kargman toppled this season as he set the South Jersey mark with eight touchdown passes just two weeks ago in a win against Camden Catholic. "To break two records in the first four games of a season, that has to be a record in itself," Woodrow Wilson coach Preston Brown told the Inquirer. Woodrow Wilson, now 4-0, trailed 17-13 at halftime. Kargman had 136 yards passing in the first half and no touchdowns. He threw for 403 yards and four touchdowns in the second half to lead the comeback win. Brown said Kargman completed 14 passes in a row at one point. Kargman leads South Jersey with 1,598 yards and 20 touchdowns, according to NJ.com. He currently holds scholarship offers from Rutgers and Jackson State. "There's a lot more to come," Brown said. "His poise, confidence and commitment to getting better, I would imagine there will be a number of schools getting in line…My job is to keep him humble and hungry." Nahzir Russell ran 11 times for 167 yards and three touchdowns as Pennsauken defeated Cherry Hill East, 37-0. Donte Jamison started off the scoring with a 90-yard kickoff return. Quarterback Deswa Evans connected with receiver Darrien Tabb for two touchdowns of 50-or-more yards. Jajuan Hays ran for three touchdowns and caught another touchdown as Florence topped Holy Cross, 48-14. Justin Tisdale and Davien Vernon both had interception return touchdowns for Florence. Joe LeVach added a one-yard touchdown run. Luca Rerpertus ran for three touchdowns, and quarterback Ethan Martin and receiver Vernie Marley connected for an 80-yard touchdown in Audubon's 26-8 victory against Haddon Heights. Nick Pellegrini tossed three touchdown passes as No. 12 Paulsboro defeated Lindenwold, 49-9. Florence’s Joe Brunnner (59) celebrates a fumble recovery in a 48-14 win against Holy Cross on Saturday. Goalkeeper Kaitlyn Freeman made 20 saves, and Logan Koester scored the game winning goal in Timber Creek's 1-0 win against Camden Catholic. Sammie Sorensen scored in the second half to give Bishop Eustace a 1-0 victory against Cherry Hill West. Olivia Hansen assisted on the Sorensen goal. Goalkeeper Nellie Manalo-LaManna made 13 saves. Clearview defeated Mainland, 4-2, behind Mackenzie Clement's hat trick. Elizabeth Bonomo added a goal, and Julia Gehring chipped in two assists. Goalkeeper McKenna Dalfonso made 10 saves. Haley Benson, Kiley Endres, Mackenzie Kelleher, Morgan Raley, and Brooke Steel scored in Shawnee's 5-0 win against Holy Spirit. Sierra Sanson, Lucy Clapperton, and Lauren Jobes combined for the shutout. Devin Sullivan scored twice, and Amber Downs and Bailey Swietanski both chipped in a goal in West Deptford's 4-2 victory against Pitman. Deanna Corsetti made 10 saves. Jessica Bray, Stephanie Gallant, Seleste Leal, Madelyn Reuter, Chelsea Seidman, and Taylor Wysokowski scored as New Egypt defeated Pennsauken, 6-0. Michael Bolognone scored off an assist from Ben Dellmyer to give Shawnee a 1-0 win against Southern Regional. Braden Dugan made five saves in goal. Christian Ball, Steve DiTomaso, and Geno Mariano scored as Haddonfield defeated Lenape, 3-1. Goalkeeper Tommy Casper made seven saves and tallied two assists. Zach Bruno, Justin Coolahan, and Jovanny Trinidad netted goals as Cherry Hill West defeated Bishop Eustace, 3-0. Goalkeeper Ian Sachs made seven saves. Seneca topped Winslow Township, 4-1, behind two goals from Jaimi Araujo. Rachel Dorn and Hannah Schwartz both scored, and Alyssa Fox chipped in two assists. Mark Basehore scored two goals and assisted on another in Cherry Hill East's 3-0 win against Paul VI. Harry Hampton headed in a goal for Cherry Hill East, and Matt Randall made six saves for the shutout. Jake Logar and Chad Yates scored goals to lead Washington Township to a 2-0 win against Williamstown. Mia Frontino tallied two goals and an assist in Haddonfield's 4-0 win against Lower Cape May. Natalie Naticchia added two goals, and Emily Smart had an assist. Julianne Calalo scored twice, and Chloe Garber added a goal and an assist as Cherry Hill East topped Moorestown Friends, 4-0. Julianne Alcamo also scored. Alexa Thomas scored the game-winner as Williamstown topped Oakcrest, 1-0.